Below is a photo showing us deciding as a group on our film idea's and deciding how to split up the work load evenly. 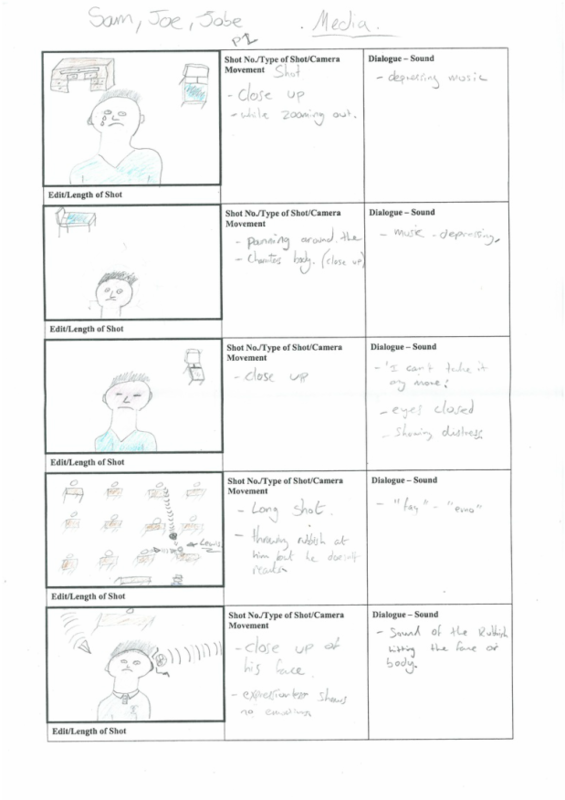 we worked well as a team as we all contributed to our final film idea and we all had an input into what we decided. 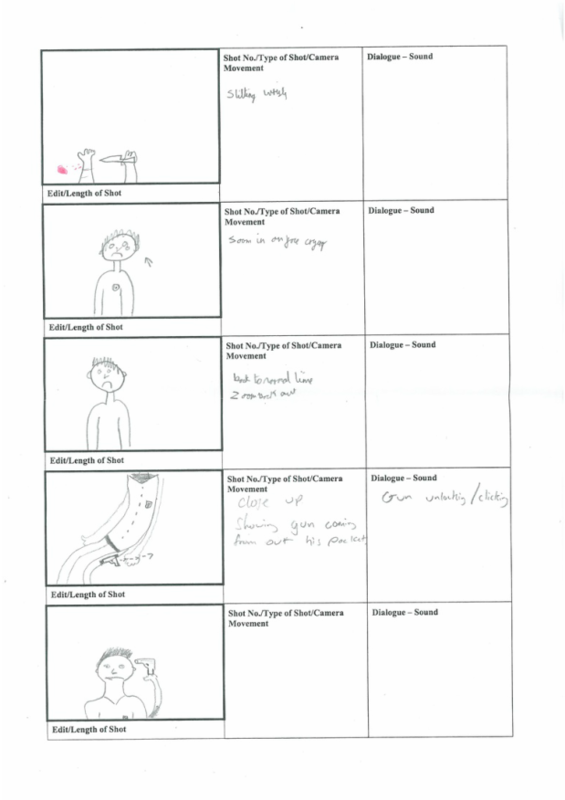 During this time we decided our film tittle and began to work on our story boards. We have decided to call our production company sinister productions, we agreed this would be a good name as it sounds scary and it sounds like the kind of production company which would make our horror film. For the logo we decided to have something simple and we used what can be seen to the left, this is a simple animation of the words sliding past each other. We decided this looks good as the dots of brown in the picture look like dots of blood. Revenge - This was a good idea for a name for our film however as there is already a popular television series by this name we wouldnt want people to get confused so we decided against this name. vengeance - We decided on this film title as we felt it summed our film idea up nicely and it sounded original. We had two ideas for our openings, the first was an idea for an opening was a slasher type opening in the woods, this would have included a mountain biker riding a tough corse in a forest type area, while this would be going on there would be a women being chased by a masked man. Then the camera would cut back to the mountain biker who sees the girl being chased and as this catches his attention he would accidentally crash, then the masked villain would continue to pursue the mountain biker and the girl together. This opening would have ended with a chase where the killer catches up with them both and murders them brutally. Our second idea was the idea we decided to make for our final project, this film idea is basically a student being bullied at their school who is depressed and decides to commit suicide, the twist in this film though is that he doesn't stay dead. Our film idea is this boy coming back from the dead to take his revenge I think this is a unique idea as the victim you see at the start of the film and feel sorry for is then suddenly the villain so we hope that the audience wont know whether they like or hate the boy. This is a rough cut we did when it was snowing, we thought the snow worked well because it would give the feeling that he has been bullied for a long time as a shot in the snow then a shot when its no longer snowing would give the effect of time passing by, however this is impractical for our actual film as we carnt control when it snows or not. Other than this i think the shots we got worked well and looked effective, we got a wide range of shots which showed the action of martin being bullied from different angles. We want our villain to also be like a victim in a way as at the start they are being bullied and picked on. We want this character to look gothic and we want our character to look isolated and alone. We also want characters to look believable as bullies, we need a few people for this who our killer can get his revenge on. For this we want some stereotypical attractive girls for our murderer to kill, these may not be present in the start but i feel it is important as its a convention of horror films having females as victims. For our film opening we will have 3 different settings. The first of these is the murderers bedroom, we want this to be dark and have loads of posters on the walls to make it look like a typical teenagers bedroom. We want mirrors for the killer to look in while he is cutting himself. The second location we will include is a classroom scene, in this scene we want students to be bullying our victim/ killer. I want this classroom to be light to contrast the dark bedroom where most of our opening will be shot. This classroom scene will be a flashback so we will turn the brightness up to show this. Our third filming location will be a street, we plan to do this to show our victim walking home being bullied, this shot will be a flashback shot meaning we want it to be bright. We will do this shot during the day time to show our victim walking home from school. In this shot we will want our character to be walking home by themselves. For our props we wont need that many items we will basically need a knife for our victim/ killer to kill himself with and we will need a lot of fake blood to make it look realistic. We don't particularly need any special costume for our film however we need smart clothes for the classroom scene and we are going to get dark Gothic clothing for the scene in the bedroom as this is how we want our character to look. As a shot in our film takes place in school and shows a kid being bullied we decided it would be best to go around school and look at each classroom to decide the best classroom for our film, we wanted a large classroom that was wide and open and looked fairly dark. We decided we needed a classroom big enough to fit about 20 people in. However we wanted the classroom to look like a traditional British classroom to give people the feel that this is a British film. In our film we have a scene that takes place with our character "Lewis" waling home for this we decided we wanted him to be walking along side a road that is not too busy as this may cause continuity errors and also we don't want too much noise pollution from surrounding cars. When filming outside we will try and get it all filmed quickly as we must make sure all the shots have similar lightings and similar weather. This was our first attempt at any make-up. we tried to create a slit wrist effect with only fake blood. When we try it again i think we should try using wax as well to make the slits look more 3d. However as a first attempt i believe these gashes look good and they show that we can make a good cut effect. to try and make it look like its been cut with a knife we used a ruler to scrape away all the blood from the center. The second image is a point of view shot which is the type of shot i am planning to use in our film. This was my first attempt at making a slit throat type effect. This looks very realistic and good from a distance however up close it looks blatantly fake. For this attempt i only used high quality blood which works well for the scabbing round the edge and the running blood on the neck however it doesnt look 3d enough to look realistic. To make this look better i am going to attempt to use wax when i next try to recreate a slit throat effect. These cuts on the wrist look far more realistic than the ones from my first attempt however they look too realistic and too deep, it looks like our character is trying to cut their arm off rather than cut themselves. I made these cuts our of make-up wax and fake blood, I think they look effective however I feel that when we do out recording I will have to make sure they don't look as deep or severe. I am very happy with this slit throat as it looks realistic and deep and it really looks like it has been sliced open by a knife which is what I intended it to look like. I feel this is appropriate for our final film and I will make it like this for our final film. I have made this from make-up wax and fake blood like the cuts above however this looks more successful than the cuts as a neck wound would be that deep when cuts would not be.
. I must be cautious of using the camera around liquids as the camera and charger are electric and could cause electric shocks if mixed with liquids such as water. 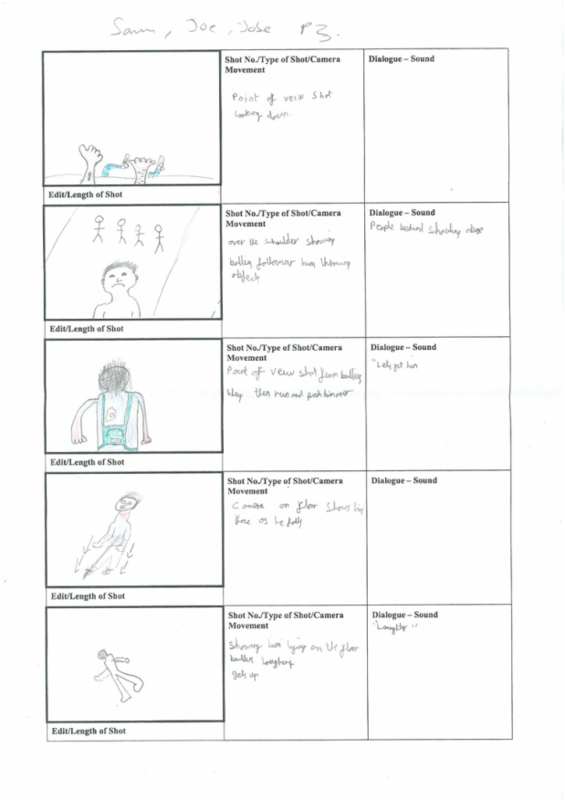 This is the first page of our storyboard and it shows the first 4 shots of our movie opening. The first three of these shots will be various production company's names and logo's. Shot one and shot three will each last about 4 seconds to give people enough time to read them, during this time it will be completely silent to help build suspense. Shot 2 however will be the Lionsgate opening which lasts around 20 seconds. We have decided to include this as Lionsgate are known for producing high quality horror films such as hostel, saw and silent hill. This will hopefully make the audience immediately suspect the film is going to live up to the high standard which Lionsgate and film 4 are known for. The next shot will be our movie title, at this stage the film will still be completely silent to build suspense, as you can see below this film title will be designed in a way to incorporate the various murder weapons our villain is using. 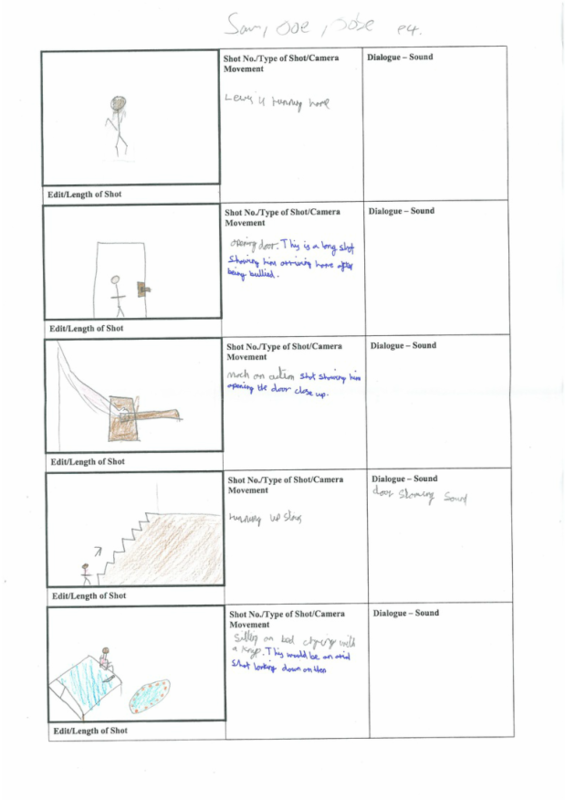 This is the second page of our story board for our opening.
. The fifth shot of the opening and the first actual recorded footage for our film which audiences will see will immediately introduce the audience to our main character it will do this by zooming out from his eye to reveal a close up shot of his face, during this time depressive music will begin softly in the back ground. This shot will last about 4 seconds and this shot will have dark lighting.
. Our sixth shot will be very similar to the first in the fact that it is showing the audience who our character is, for this we have decided to pan the camera around the characters head, this will last about 5 seconds and during this time the depressive music will continue but Lewis will be reading the suicide note in his head, for this we will do a voice over. this shot will have dark lighting to fit the theme of it being a horror film.
. Our seventh shot will be similar to the first as it is a mid shot of Lewis, this will tie in with the voice over, our idea is that as our character says I can't take it anymore his eyes will close and then there will be a flashback. This shot will last about 3 seconds and this shot will have dark lighting.
. Our eighth shot will be shot in a very different setting this shot will take place in a bright classroom to contrast the previous shot. This shot will be a long shot which will show Lewis on his own in a corner isolated from the rest of the class, during this scene the main characters class mates will be throwing stuff at him and calling him names and basically bullying him. When editing this shot we plan to put a blue tint/ shading over it to make it clear that this shot is a flashback. This shot will last around 6 seconds during which time the depressing music from before will continue quietly in the background and the dialogue from the bullies will be heard as well.
. Our ninth and final shot on this page will also take place in the classroom the same as the shot before, this means the lighting will be the same and we will use the same colour effect over the top as before. This shot it a close-up showing the face of Lewis while the bullying is going on, this will show him completely expressionless as if he is used to the bullying and he's trying to make it look like it doesn't bother him. this shot will last around 4 seconds and it will show rubbish hitting him in the face. the music and insults will continue through this shot as well as the sound of paper hitting him in the face.
. Our next shot will show Lewis in his room again looking down at his wrists, in this shot there will be scars on his wrist showing he has self harmed before and that it has been going on for a long time, in this shot the music will continue in the background however it will begin to get gradually louder. This shot will be a point of view shot which lasts for about 3 seconds.
. Our next shot will go to another flashback. This will show our killer being followed home with bully's shouting abuse at him. This shot will be an over the shoulder shot looking behind him at the bully's. in this shot the music will continue in the background but the audience will also be able to hear the insults being hurled at our character. this shot will last about 3 seconds. As this shot is a flashback it will have the colour tint on it from before to make it clear to viewers.
. Our next shot will be a point of view shot from the bully's this will show our main character from behind showing him just walking and putting up with it, in this shot one of the bully's will then run and push our main character over. This shot will last about 5 seconds in which time the music will continue and the bully's will continue to bully Lewis. As this shot is a flashback it will have the colour tint on it from before to make it clear to viewers.
. our next shot will be a close up shot of his face as he hits the ground. For this we will have the camera on the floor so you see his legs fall then a few seconds later his face will land just in front of the camera to show his expressionless face. This shot will last around 4 seconds During this shot the music will continue however the insults will stop and the bullies will laugh instead. As this shot is a flashback it will have the colour tint on it from before to make it clear to viewers.
. Our next shot will be a mid shot showing Lewis getting up slowly, during this shot he will still be expressionless to show that he is used to it and to give the impression he doesn't care anymore. This shot will last around 5 seconds in which time the music will continue and the bully's will continue laughing and they will begin with the insults again. As this shot is a flashback it will have the colour tint on it from before to make it clear to viewers.
. Our next shot will be a point of view shot from our bullies as they watch Lewis run home. this shot will last about 3 seconds in which time the music will speed up and become more dramatic and the bullies will shout some more abuse. This shot like all others in the flashback will have the same colour tint on it as mentioned before. make it clear to viewers.
. Our next shot will be the second half of the Mach on action shot. This shot will be a close up on Lewis's hand showing it opening the door handle. This shot will only last about 1 second during which time the music will continue and you will be able to hear the door handle being opened. As this shot is a flashback it will have the colour tint on it from before to make it clear to viewers.
. Our next shot will be a long shot looking up the stairs showing our character running up them as fast as possible. this shot will only last around 3 seconds. During this shot the music will continue and you will also be able to hear the sound of him running up the stairs and stamping his feet as the door slams shut behind him. As this shot is a flashback it will have the colour tint on it from before to make it clear to viewers.
. Our next shot will be an Arial/ high angle shot set above Lewis showing him sitting alone on his bed crying with a knife besides him. This shot will show look down on him to represent everyone else looking down on him and to show how alone and week he is. in this shot the audience will be able to hear him crying while the music continues in the background. This shot will last around 4 seconds. As this shot is a flashback it will have the colour tint on it from before to make it clear to viewers.
. Our next shot will be a point of view shot showing lewis looking down at his wrists holding a knife, in this shot there will be no scars on his wrists like there were before, the reason for this is this shot will show him slitting his wrists for the first time. For this shot I am going to use fake blood to make it look like he is actually cutting himself and to make it look realistic. This shot will last about 5 seconds. in this shot you will continue to hear him crying as the music continues. As this shot is a flashback it will have the colour tint on it from before to make it clear to viewers.
. Our next shot will be a close-up shot of Lewis's face. This shot will be the final shot in the flashback and it will just simply show him crying. During this shot the camera will zoom into his tear filled eyes. This shot will last about 3 seconds and it will have the same tint on as the other shots in the flashback. During this shot the audience will be able to hear him cry as before while the music continues.
. The next shot will show Lewis pulling a gun out of his pocket. this shot will be a mid shot from the side of our character. In this shot Lewis will take the safety off of his gun and sit holding it by his side. This shot will remain silent except for the sound of Lewis unlocking the gun and it will last around 6 seconds.
. Our next and the final shot of the opening will be aimed to surprise and shock the audience and make them wonder what's going to happen next in the film. this shot will be a mid shot showing just the top half of Lewis so that the gun cannot be seen. In this shot Lewis will take one final deep breath then suddenly without warning lift the gun to the side of his temple and fire committing suicide. This shot will last around 5 seconds and will be a dramatic ending to the opening making the audience want to know what's going to happen next. This shot will be silent until Lewis fires then the gunshot will be heard. This is just an ordinary piece of paper however it is important for our film as this prop will be used with the pen above to show our character writing their suicide note. This is important as it will be used in a few shots in our film and it is needed to make the voice over make sense. This is one of the most important props for our opening, as all horror films include a lot of blood we felt we had to too. This is high quality fake blood which creates 3D cut and scab effects as well as just normal blood. This will be used for the cuts on the wrists of our character and this will also be used to create our cut throat effect which will be shown at the end of our opening. This is a very large and very sharp knife, this would be used in the film as the main characters murder weapon however in the opening two minutes this knife will only be shown for a few scenes when our main character slits his throat. We have decided this is a good knife for this as its a believable size and it looks scary. This knife is much smaller and will appear in our opening for a few scenes, this is the knife which our main character will use to self harm in the opening two minutes of our film. We decided this as if he was to use a big knife like the knife above it would look unrealistic and it would look like he is trying to decapitate his arm rather than slitting his wrists. This is the shirt which we have chose for our main character to wear while in his bedroom, We decided we wanted our character to have a gothic look as people with this look are often outcasts of society, when making our choice we had to make sure that the shirt we had our character wear had short sleeves, this is important so that the character could slit their wrists for certain shots and so that the audience could see these cuts. This is the hoodie that we want our character to wear during the classroom scene, the reason for this is that people who dress in this kind of way are often those who get bullied and it will add to our gothic look which we are aiming to achieve. We plan to start filming on the afternoon of Friday the 22nd of February, the reason for this is that the three members of our group and our actor are all available meaning it is the perfect time to film. Our plan for the day is to arrive at the filming location for 12:30 where we will then decorate as a group and make suitable for filming, then the actor will get changed and we will prepare to film. We expect this to take around an hour. So we will start at about half 1. First we will record the shots without any blood and make up for example the first shot of the camera zooming in to the characters eye and the shots of our character writing their note. We expect this to take half an hour, then we will start with the make up on the wrists- we expect the make up to take 15 minutes. We will then record the shots with slit wrists such as the character looking down at them and actually slitting them. This should take around 30 minutes and we will follow it by doing the makeup on the neck. After this we will do the rest of the shots which should take 30 minutes, then we should be finished. As the school computers have the software required for editing we can only edit during lesson time. We expect our editing to take around 4 hours meaning we expect we will have all the editing done by Monday the 11th of March. To meet this expectation we are going to edit in the morning on monday the 4th of march, in the afternoon of friday the 8th of march and then finish editing on the morning of the 11th of march.